For many people, linear means a straight line. One viewpoint is to say it is one-dimensional. The second meaning in my dictionary describes linear progression as a series of steps. How you define a step in thinking may give rise to new problems. Principally, linear thinking includes copying previous solutions. Implicit in criticisms of linear thinking are that this is unimaginative, restrictive and, all too frequently, reduces the available opportunities. Linear thinking is what happens when you look at the same thing in the same way, each time you view it. Each step of a problem is considered only in the light of obviously relevant experience. You notice that somehow ‘linear thinking’ has taken on new meanings beyond the association of the two words. This seems wrong to me. Let us restrict the term to thinking in steps that seem entirely logical obvious non-choice moves. Then let us take the consequential comment as just that, consequence and comment. The sense in which linear thinking is restrictive is that critics point to aspects of the current ‘problem’ which are being ignored. Some of which is not linear thinking, but poor definition of the question to be tackled. Linear thinking has its place. Diagnostic trees, especially ones that include statistical likelihood of results, are very good tools. One description of linear thinking (here) says that “the thinking only moves if there is a direction” and that for lateral thinking “the thought process moves in order to ‘generate’ a direction”. There is persistent argument that women are generally non-linear thinkers, confusing this with multitasking. What is linear for one person is often non-linear for another. 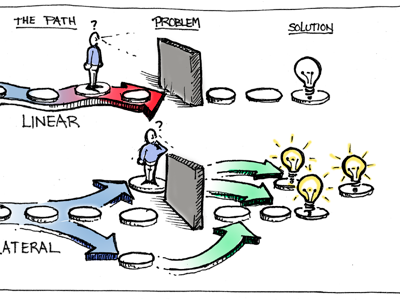 An intractable problem is probably best approached from a different start-point – lateral thinking is required. That could, for some, be a description that draws back from the problem as posed and looks at the larger picture. If you view the sea of possibilities as two-dimensional and the previous approach as linear, then all that is asked is to start from a different place. For many thinkers, that is enough to produce an answer. For those who think linear thinking is straight line, ordered list thinking, please also consider approaches described as trees, grids, arrays, recursive (with exits) and landscape. Add to that associative (pattern matching). For many people, straight-line thinking is muscle memory, comfortable and habituated. I can see how habitual thinking would be comfortable, but do not accept that the comfortable thinking would be linear – especially not to others. That would depend on experience (meaning its variety not its quantity); common experience would generally cause people to agree on solutions and routes to them. A different experience might well indicate a completely different ‘obvious’ solution. In a danger situation, some cogitation is often a bad thing – when what is needed is a ‘correct’ instinctive reaction. We can learn these. One I never understood was dropping to the floor at the sound of a gunshot. If you heard a single shot, you already missed the bullet passing you; if there’s a second shot, you should move (or have moved). If you’re a soldier you’ve already hit the floor, because the military mind assumes over-powering force, so rarely only one bullet. Instinct is based on experience and what was learned from that. Good training takes the thinking through the process and creates the instinct; it makes the pathway in your head so that you react as if this is linear thinking. One writer at the above site, Marty S., makes two discuss-able points: (i) Knowing when linear thought will best accomplish the purpose is one thing, being disciplined to do the right thing is another. (ii) The ability to discern when to use lateral thinking and when to build a pattern and follow it through a linear process is probably, at its root, the beginning of success in any new endeavour. To his first point, there is a confusion between purpose and rightness that I would put down to poor definition of the problem considered. To his second, he seems to distinguish between lateral thinking and pattern-based thinking. For those looking at a landscape and calling it both allowing of laterality and patterns, then the route through this landscape would indeed be linear. Is this the mathematician twisting meanings? Perhaps; frequently in mathematics, explaining what the problem is at root is the hardest task. I see few differences here in problems people want to discuss – generally they want help in identifying the problem, not the solution. Finding the problem is a case of asking the right questions and being honest. Honest enough to admit when you don’t know, when you don’t know what you want and when you’re kidding yourself. One technique I like came from reading an odd book when still new, the Dice Man (George Cockroft, 1971, aka Luke Reinhart) in which psychiatrist Reinhart lets dice make all his decisions. Subsequent republishing added the comment ‘This book will change your life’. Leaving you to explore this yourself if you’re new to the idea, I suggest this corollary: on the occasions you think you really don’t care one way or the other over a decision, let a coin or a die make the decision for you. If you then discover you don’t like the decision, you learned that you did have a preference. Surrendering all choice is, as the Dice Man points out, not likely to leave you in comfortable place, though you are guaranteed new experiences on the way. Commentators seem to miss that the options chosen by Reinhart were significant expression of choice: adding ‘or something else if it is a six’ is a bit like None of the Above (NOTA) which accepts that consent includes the ability to withhold consent – as applies in France, Spain, Greece and the Ukraine. See also a Richard Pryor film, Brewster’s Millions. Note that illegal votes count in forming the total where an absolute majority of votes made is required, so is equivalent to a vote of No to all candidates. See, p402 (thanks, Wikipedia). Which is wandering off the point, while interesting. Yet this is what is required when allowing lateral thinking to occur, acceptance that running around the point may be useful. Committee chairpersons note, please, that letting the meeting wander off point for a while can be useful; dragging it back gives you opportunity to use the content constructively. So the use in doing that requires you to see any pertinent relevance. So let us look at non-linear thinking. I listed thinking styles above as trees, grids, arrays, recursive (with exits), landscape and pattern matching. Which took no great effort, so imagine a throw of the die, seeing a six and add ‘or something else’. A grid [many other names] requires you to attribute factors and weight them. It is only as good as the information you put into it (obviously); it is (too) easy to skew the results to support a decision made some other way. It looks good, but it is flawed (too easily). Providing the weighting is based on, from my reading, mostly emotion. That would not be a bad thing in itself, but the quantification is the hard bit. What I haven’t come up with examples that have sufficiently unbiased information to let an opinion be formed. These work well if used in stages: yes/no/don’t know; 1,0,-1; digit values and weighting. This process let’s you realise what is important - to you. Some of the process causes you to re-evaluate what (whether, which) factors are important. I could use these constructively for students looking at tertiary education choices, though it would be hard to persuade them to add new factors. Try it, but include the Open (and staying at home) to see how your opinion changes. Decision arrays are only multi-dimensional decision grids. You’re most likely to come across these in a programming course. In the real world (well, the other one) you get around this by combining methods - making nested decisions and then using a grid. You can avoid this case by using a tree. The problem comes when the properties of the decision are inter-related, so the clever bit lies in finding the questions to ask that classify the problem (declassify it, perhaps) into discrete areas. Tree diagrams (also decision trees) have decision points (between choices) at each node. How well these are expressed (for your current issue) matters. For many people thinking of trees, they stick to Yes/No questions. I suggest that these are easy to follow if you’re trying to write an ‘expert system’, but they are only as good as the questions, so each question needs a quality check as part of its answer. Example: do you have an instinctive answer to <this problem>? Can you [attempt to] explain why that is? Is your experience useful [based on more than a single example]? Is that example relevant? If you like these, start using mind mapping. Advanced users add probability values as in the statistics version of decision trees. Read Wikipedia and see the related influence diagram, found in operations research and management science courses. Their biggest advantage is that they provide insight into a problem even when data is soft or missing, but where expert knowledge is available to reveal options. As I see it, it is the quantification of risk that is the problem; it has the same effect as the weighting in grids, above. Recursion applies when you recognise that a decision has an effect on an earlier one. It requires some equivalent of a GOTO statement. This tends to exaggerate one component of your decision. It has good use in process control, but I’m struggling to find an example that belongs in a decision process – a process requiring a decision to be made, as distinct from the decisions for a process to make something. That’s one of those cases where the word order has a crucial effect on meaning, something my Chinese colleagues always find very hard to untangle. I found several descriptions of decision landscapes in the field of biometrics, where the implication was a use in security, whether of information or personnel. There is some interesting work to read in understanding behaviour (the consequences of multi-layered decisions). I found one case looking at foraging of animals as behaviour in a ‘risk-uniform landscape’, and skimmed it. It seemed to me that making the assumption that the observations are correct and then reversing observation and decision might be fruitful – if, for example, sexual relations (non-foraging activity) occur, then the perception is that the environment is relatively risk-free. An economic equivalent might be that work-displacement (or avoidance) activities occur when there is perception of low need to be generating income. Managers would disagree (and with each other). Similarly, foraging activity was observed to be patchy, based upon other facets (such as the location of other foragers). The economic(s) parallel is obvious, I feel. Pattern recognition has many modern meanings but the one I am chasing is that sense that says, “this situation is similar to that one”, where similar might also mean has parallels or equivalence. That requires a background of experience or access to it. So I looked at data mining in the information age. Read Wikipedia on data mining and see it as one future; for a business it offers a significant effect on the way companies treat their customers, targeting people likely to respond. You might like the idea of the alpha consumer, one step ahead of the crowd and setting trends. The need is to have consistent data and there is far too little effort made to maintain data quality (at a high level, having data that is consistently poor is too easy). Small businesses are unlikely to have any suitably large database from which mining can occur; their best likely application runs along the line that says ‘Customers who <verb> this item also <verb> these items’. It occurred to me, just before I read the very idea online, that this topic will soon run up against privacy issues; the test that is required is that, given an anonymous behavioural description, can you work backwards and discover who the people are who fit? It is one thing to show that 90% of RX-8 owners are fitness freaks (they aren’t, I’ve just invented a connection) working in technical fields with a likelihood to have bad back;, it is another issue entirely if you can be identified from a physiotherapist’s patient list as being a probable Mazda owner of the immediate future, enough to be targeted by an ad campaign. That also confuses cause and effect in a way I suspect may be typical – and itself but one version of the dumbing-down that seems to result from every instance of clever use of brains. Of course, various groups of humans practising cannibalism have found that the best use of brains was as food. I added a ‘been’ counter to all essays, then moved them up to the title line, where they don’t show. So this one can stay here and we’ll see if it works. ….It didn’t work for any appreciable length of time. I haven’t (yet) aded the relevant bit about multi-tasking. The title is unimaginative. I wrote this over lunch. The number of essays (this is No 72) is getting unwieldy but I’m concerned that if I sort essays by type some won’t be read at all. Groupings would be something like: living in China (separating early revelations with later observation); sports-related topics including health; genuine (and often boring or repetitive) commentary of the sort I really would have used as Assembly material; the stuff that people would rather wish I used for assemblies – and often did. Some reader reaction would help. Total email receipt of comment ever, including passing comment from regular email writers and barring just thanks, is less than one a year, ten in total. That just says this is an indulgence. Yet two would-be colleagues in China read almost everything (and then wrote to say thanks). For their sake, this was worthwhile, but then they, as a group, would benefit the most from a division into topic groups.